Hurricane Irene hit most of the Northeast this past weekend, the same weekend that I was scheduled to go upstate on a retreat to Lake Champion. Although it rained for most of the weekend and I was stranded at Lake Champion until Tuesday, this picture captures the scene on Monday after the storm ended. Peaceful and serene. "Young Life’s Lake Champion is a premier 370-acre year round retreat center located in the foothills of the southern New York Catskill Mountains. 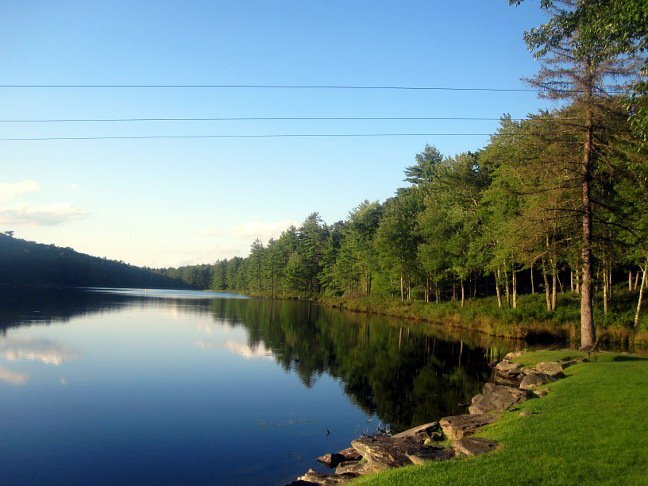 Our facilities are nestled amongst towering pines, peaceful streams, and overlook our spectacular 50 acre lake which is brimming with a variety of fish. Lake Champion is available for booking during the school season from Labor Day to Memorial Day. During the summer, Lake Champion is filled to capacity with Young Life groups from across the country enjoying a week guaranteed to be the "best of their lives."